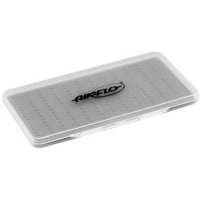 Airflo Slim Jim fly Boxes are the ultimate pocket box for the angler who wants to be on the move but instantly recognize the box containing the fly they need. The super slim design featuring slit foam allows several boxes to be carried in each pocket, more than enough for a day’s fishing! Finally a great waterproof fly box that won’t break the bank. Designed for flies 10, 12 and 14. 5 pocket slitted foam in lid. 8 compartments in base with magnetic lid, for standard flies. A fly box designed for fly sizes 12 - 20. 8 threaders are included with storage for a further 6 threaders. 6 rows of slit-foam in the base hold up to 138 flies. Waterproof, slit- foam case with swing leaf for flies from size 10-22. 8 pocket slitted foam in lid for standard flies. 12 compartments in base with individual clip closure polypropylene lids. 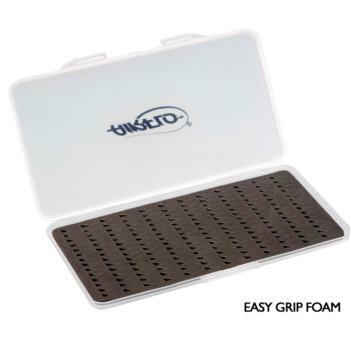 4 Micro-slit foam faces, each with 10 pockets for small flies, holds up to 900 individual flies.